Beat Summer Pet Anxiety - Meet ThunderShirt! Beat Summer Pet Anxiety – Meet ThunderShirt! Spring and summertime can bring a lot of fun in the sun for us as well as our pets! 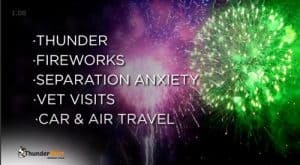 Unfortunately for our pets, it also brings loud thunder storms, fireworks and lots of travel; which isn’t always enjoyable for our furry friends! Fortunately, we do have nice alternatives to medicine for calming our pets. One of these nice alternatives is the original Thundershirt! Thundershirts can be pricey, but (lucky for you!) we have them on sale for $29.99 in the clinic until July 15th, while supplies last! We have limited stock so be sure to come in soon to grab one. 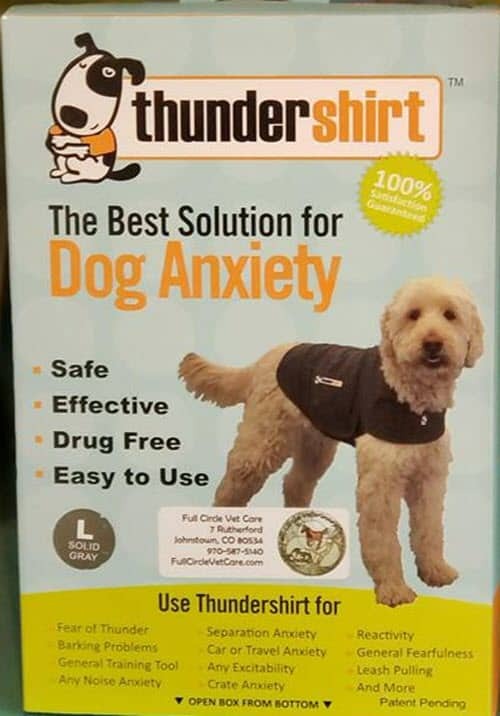 The original Thundershirt is a safe and effective, drug free easy to use alternative for calming our dogs. It works by applying consistent pressure to your fur baby’s torso. This pressure has a calming effect for most dogs, much like a big, comforting hug or a mother swaddling their babies works for us. Thundershirt’s patent-pending design works for symptoms such as panting, shaking, excessive barking/whining, scratching, bolting, hiding and eliminating indoors. Thundershirts are a great way to calm your furry friend this summer, so be sure to head into the clinic to grab your Thundershirt.